Ancient stone circles have held mystery and fascination for people of all ages since their secrets were lost in the mists of time. Today, with renewed interest in the ancient ways and the gradual renewal of spiritual beliefs, stone circles are again being constructed by those who hope to re-establish some of the lost practices of our ancestors. It must be remembered that stone circles in ancient times were not raised by or for the use of individuals. They were constructed by the members of a community or tribe for worship or to gain knowledge for the betterment of the group. Because of the numbers of people involved in its construction it already possessed a strong, though unfocussed, spirit of place even before its final dedication ceremony. The ‘grand opening’, which only rarely involved human sacrifice, strengthened and polarized the spirit of place and gave the enclosure its sanctity. The construction of a modern stone circle is usually a personal project, the efforts of one individual, perhaps with unskilled help, to copy a great prehistoric circle on a small scale or the wish to recreate the atmosphere often experienced in such an ancient enclosure. There is no doubt that a stone circle constructed today ‘with intent’ will have a spiritual atmosphere because the constructor thinks and feels deeply about the project and the circle automatically develops a spirit of place which is reinforced each time the circle is used. My research into the cult of ancient life stones1 has naturally put me into dowsing contact with some of the long dead constructors of prehistoric Stone circles. The information gained from these stones has given me some understanding of the Principles involved: I know how the sites were chosen, the purpose of each type of circle and roughly how they were used. Let me give a brief review of the basics before making recommendations for the raising of a modern circle. Calendrical, for determining the timing of particular ceremonies. Sacrificial, for dedicating agricultural produce to the appropriate gods. Funerary circles for laying out the dead. Calendar circles, whether of posts or stones, only came into use late in prehistoric times. Typically they were made of huge posts, some as great as 3ft in diameter and weighing several tons. Over time the posts rotted and no remains can be found today above ground although archaeologists often find dark marks in excavations which show where the posts once stood. stone circles as calendars were unusual, being confined to areas where trees were stunted or absent and where stone was readily available. Whatever their materials, calendar circles needed tall uprights so that, at the significant times of year, shadows from the circle could fall on the central upright. For this reason, too, stones were chosen with a projection at the apex or -were shaped to a point so that their shadows were sufficiently narrow and elongated. Stone sacrificial circles are also uncommon because posts were preferred; when stones were used they were rough and unshaped. The overall design was typically a ‘pan and handle’ with the handle being a short entrance corridor aligned on midsummer or midwinter sunrise. Stone has a universally timeless quality, it is looked upon as being indestructible and everlasting. It is also believed to be the best material for housing spirits and the souls of living creatures. For this reason funerary circles for laying out the dead have always been made of stones, some as large as loft, some as small as 9 ins. The most ancient funerary circles which I have dowsed were more than 100,000 years old. In prehistoric times good stones were used over and over again, each time with a specific ceremonial purpose in mind Then, as the old ways were forgotten, many were removed or broken up to make roads and houses. Some rebuilding took place in the 15th, 16th and 17th centuries when newly rich landowners wished to raise their status by building follies and other structures of interest on their newly acquired estates and often renovated or moved stone circles from their original settings. From these comments it will be realized that great care must be taken when trying to characterize a circle. It is all too common for us to believe that existing ancient structures are original when this is often untrue. One of the most popular stone circles is the Rollrights in Oxfordshire. It is a favourite with dowsers and other sensitives and also is much used for clandestine pagan ceremonies. 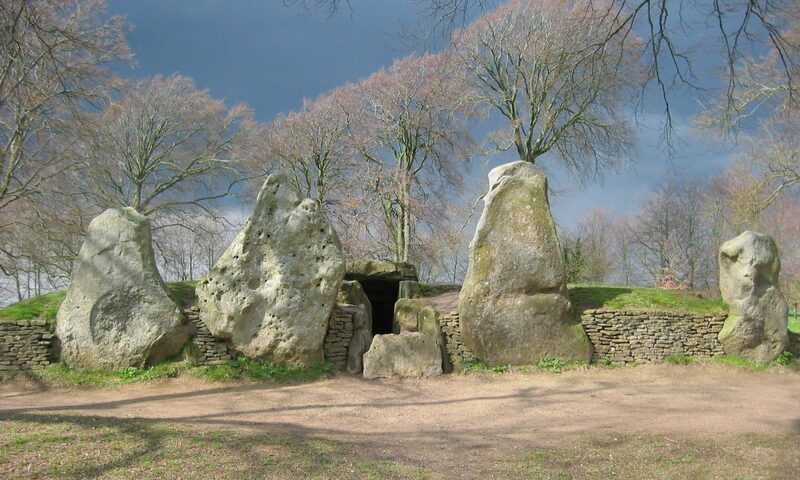 Visitors assume that all the stones are original but this is not the case, many were brought from elsewhere in the 16th and 17th centuries. The original sites for stone circles were chosen by those who could hear the voice of Mother Earth. The sensitive, usually a high ranking druid, would open his mind and roam the area until he heard her voice most strongly. That place would be marked as the spiritual centre of the proposed circle. He then ‘felt’ for the geometric centre which was over the up welling source of the same waterline which passed under the spiritual centre2. The spiritual centre and the geometric centre were quite close together in funerary and calendar circles. A sacrificial circle differed in that the altar, sited over the spiritual centre, was against the side opposite the entrance and hence some distance from the geometric centre. In this position it would be lit by e.g. the rising midwinter sun. There is no need for our modern circles to coincide in purpose with the ancient ideas; few people would want to meditate in a circle designed for laying out the dead! Our circles are to be purely for peace and pleasure. However, we have to decide how many stones should be used. Many Iron Age circles tended to use large numbers of stones or posts in order to impress rival tribes and these should be ignored as templates. The oldest circles I have investigated had 9 stones, 9 being a very ancient magic number. If in any doubt I am sure that your pendulum can help you to decide. What, then, are the recommendations for the construction of a modern, personal stone circle? The size of the stones is not really important. If large stones and the space to raise them are both available then the resulting circle will be visually impressive and a source of wonder to visitors. If not, small pebbles which can be held in the hand will work just as well even if friends are less impressed. For those with little or no garden there is an obvious advantage in using small stones which are easy to carry and can be set up anywhere. One of the founders of modern Druidry, IoIo Morgannwg, in 1819 made the first Gorsedd circle at the Welsh Eisteddfod “with stones taken from his pockets”. The article by Dawn Scott Marsden, “Making Your Own Stone Circle” in a past issue of the JBSD3 may also give you some ideas. Siting of the circle is not as critical as it was in prehistory as it is to be used for a different purpose. Instead of ‘listening’ for the voice of Mother Earth dowse for the spiritual and geometric centres. Choose your words carefully e.g. “Point towards the spiritual centre for my circle and cross when it is reached”. Then do the same for the geometric centre. They should be within a few feet of each other, if not, try again at a different place. How do we choose the size of the circle? The idea is to make it just large enough to contain our mind fields4 which means that it will be larger than the average aura. For most people the diameter should be about 12ft so one can begin by roughly measuring out a circle of 6ft radius on the dowsed geometrical centre. Then, standing or sifting at the spiritual centre, decide whether you feel mentally conformable. if not, dowse for an increase in size and try again. In a fixed circle of stones you may like to leave a larger gap as an entrance and face it towards midsummer sunrise or sunset to celebrate the long days of summer. Small or portable stones can be spaced evenly around the circumference of the circle. For those with pocket sized stones for a portable circle, numbering the stones and placing them always in the same relative positions will increase the strength of each placement. However, don’t forget to deliberately remove the energy dome when you remove the stones. Meditation or relaxation should naturally take place at the spiritual centre but, if you are badly upset or angry, try and calm down a little before entering the circle to avoid the possibility of strongly negative fields being fixed in place. Should the circle be deliberately energized? Yes, it makes it stronger and more personal. Sit comfortably at the geometric centre. Next imagine an invisible wall rising from the circle of stones and meeting to form a dome over your head, like the two halves of a giant clam shell closing. You will now have a hemisphere of energy over you like an Eskimo’s igloo, and which will remain in position even when you leave. Dowsing can confirm that you now have your own sacred space within this hemisphere, a space where you can relax away from the pressures of the outside world. Good luck with your first stone circle! This article was written before Tony Hathway’s ‘Building a New Stone Circle’ which was published last quarter (Newsletter Sept. 2000). It is interesting to see the different approach that Billy Gawn, Tony Hathaway and their ‘gang’ used to construct a modern stone circle – very different from the small personal circles described above. I look forward to the follow up article which will describe the energy findings.